The Newport 406 High-Performance Large Platform Two-Axis Linear Stage has a 5.50" square top and a 2.250" through aperture, yet offers two axes of motion in a stage which is only 1.730" tall. 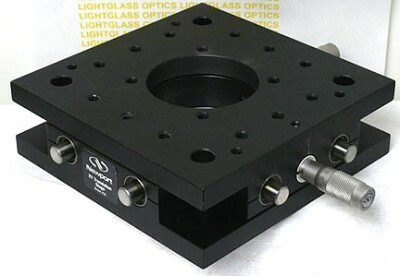 Each axis can be moved 0.5", using the included Newport SM-13 micrometers. The 406 is only different from the previous 405 model in that Newport now is able to use their line of standard micrometer actuators to drive this stage. So, Newport DM-13 Differential Micrometers can be added at extra cost, if you need the precision, or other Newport motorized or simple micrometers can be used. In a horizontal position, this stage can support a 100 pound load, due to its ball-bushing construction.